Revamping an ice cream truck into a mobile tea business is just one part of Molly Gaylord and Karina Vlastnik’s vision for Steep Tea Company, based in West Oakland. They are renovating the “Steep Jeep,” a 1967 Jeep named Belle, so they can use it to serve hot tea, iced tea, tea lattes, tea soda, tea flavored soft-serve ice cream, as well as loose tea to take home. Fueled by a Kickstarter campaign, Gaylord and Vlastnik reached their fundraising goal of $22,251 last year and now plan to expand their local tea empire. Gaylord and Vlastnik met in art school in 2007 at the Academy of Art University in San Francisco. They graduated, parted ways and moved from the Bay Area, but two years later they went on a trip to New Zealand together. While traveling abroad, they lived out of a camper van and began experimenting with drinking and blending their own teas. Previously die-hard coffee drinkers, both Gaylord and Vlastnik had only casually tried drinking tea, and this was the first time either got involved in trying different blends and varieties. “We found a small loose leaf tea shop outside of Auckland on our second day and decided for the duration of our trip we would wean ourselves off coffee. From then on, we spent our days pulling off the road to boil water in the van, making our own blended tea and exploring the coast,” said Gaylord. They say Steep is trying to create a more modern approach to tea consumption, breaking away from traditional Asian and European styles and making their own unique “American” brand. In most Asian cultures, formal tea houses are common on every block, serving tea in fine china, and in Britain tea is typically served multiple times a day, prepared as black tea with hot milk. Steep blends are meant to incorporate all styles of tea culture and focus on using local, seasonal ingredients. They prefer loose leaf tea, saying the tea bags that can be found in many grocery stores or coffee shops are essentially made of leftover tea leaves. “In all the tea provinces, they pull all the finest grade tea from the top, and everything you find in commercial tea bags are the trash. When you do not have the full tea leaf, it affects the flavor and the quality,” said Vlastnik. They officially began operating their company in June, 2014, focusing on herbal, black and green tea. The tea leaves are purchased from all over the world, and Gaylord and Vlastnik dry and source their own herbs, citrus and roots and blend them into each tea mix. The luscious smells of vanilla and sage waft through the Steep Tea working room, which is in the women’s home in Oakland. The room is open and clean; a calendar and Steep Tea advertising hang neatly on the bulletin board, and in the middle of the room a table is set for a mid-morning tea break. All the tea blends are mixed in large clear round cambros (big containers typically used in food service). The mixing is done by hand with carefully measured components for each batch. A few of the popular options available are the Mrs. Rooibson blend, a mixture of rose petals, cinnamon, clove, peppermint and rooibos (a Southern Africa herbal tea); the Chronic Wellness blend, a mixture of chamomile, echinacea, lemon verbena, citrus peel, skullcap, and St. John’s wort; and the Deep Steep blend, a mixture of barley, roasted corn and hojicha, which is a kind of Japanese green tea. The majority of their tea is sold in wholesale batches, meaning larger quantities of the blends, rather then individual tea bags. Most sales come from cafes and restaurants in the East Bay, San Francisco and Los Angeles that want to sell the tea in their stores, and buy through Steep’s website. 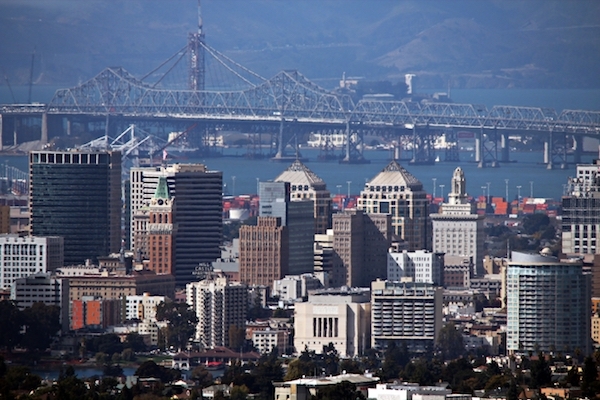 “When we first moved to Oakland about two years ago, we were still fairly new to the area. So we went around finding local places we enjoyed and approached people about offering our products,” said Gaylord. “In addition to those sales, we also try get involved in private events and local pop-up events to allow ourselves to not just sell tea, but to also make people handcrafted beverages and interact with customers.” Their idea is to park the Jeep outside gallery openings, be invited to cater at weddings and parties, and to be part of pop-up events focused on art, community and fashion in the Bay Area. While the company is slowly expanding, both Gaylord and Vlastnik work full-time as restaurant servers to support themselves financially. Next, before Gaylord and Vlastnik can take Belle the tea truck onto the streets, they have to finish putting a pop top on her, painting the exterior, and building the inside up to meet health codes. “Once we realized there was a clear gap in the Bay Area, our mission was clear: We needed to bring a higher quality of tea to the people with a fresh and modern approach,” said Gaylord. Molly and Karina sample one of their favorite kind of teas at their home in Oakland. Steep Tea is mostly sold for wholesale purchases and can be found in many cafes and stores in the Bay Area.